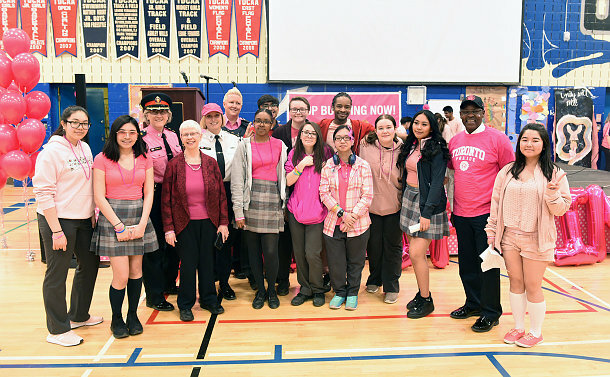 Chief Mark Saunders and other Service members joined John Paul II Catholic Secondary School students and staff on April 10 to mark International Day of Pink. Communities around the world unite on this day to celebrate diversity and raise awareness to stop homophobia, transphobia, transmisogyny and all forms of bullying. 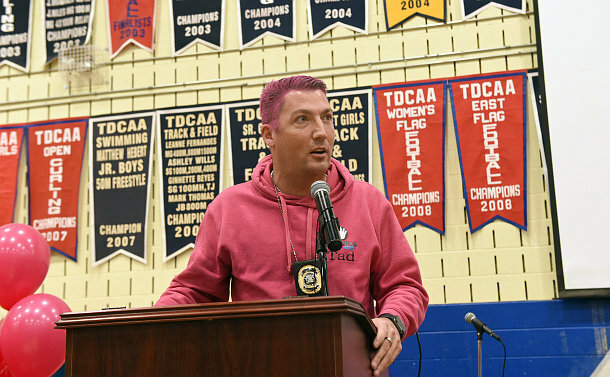 “Today we wear pink and it is only as a reminder of what makes Canada so great,” said Saunders. “It is because we understand the importance of inclusiveness, which is what defines us. We are the most diverse city in the world and what we celebrate well is that we have tremendous respect for one another. So whether it is homophobia, transphobia or bullying, these are things that do not symbolize who we are as citizens. Calgary Police Service (CPS) Const. Tad Milmine was the keynote speaker. Milmine, who spent almost five years with the Royal Canadian Mounted Police before joining the CPS in April 2014, shared his story of growing up in a home in Cambridge, Ontario that was filled with neglect and abuse. “For 12 years, I was locked in a basement and the only time I was allowed out was when I went to school,” he told a packed gymnasium. “I wasn’t allowed to take part in after-school activities or go out on weekends. The rule was that I was to be in that basement, where the windows were boarded up, at all times. Const. Danielle Bottineau, the TPS LBGTQ liaison officer, was instrumental in organizing the event. Bottineau also acknowledged her policing colleagues for their support over the years. International Day of the Pink started after a Nova Scotia teenager was bullied in 2007 for wearing a pink shirt to school. 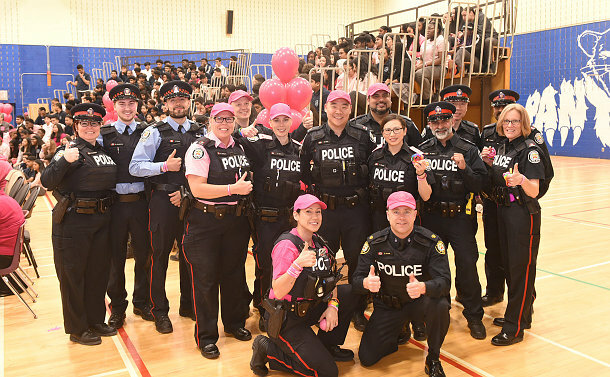 His fellow students rallied behind him by wearing pink to show their solidarity against Lesbian, Gay, Bisexual, Transgender and Trans Queer (LGBT)-based discrimination. Celebrated on the second Wednesday of April, the celebration seeks to support the work of students, educators, communities and businesses in their efforts to stop bullying, discrimination, homophobia and transphobia. 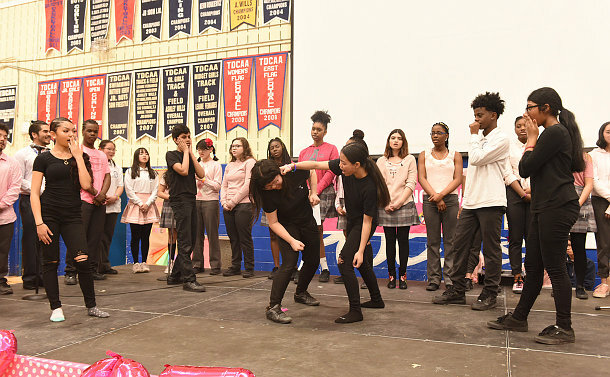 The celebration at the Scarborough Catholic school also featured songs and spoken word performances by students.